Looking for a mil-sim gun, that won't cost you an arm and a leg? 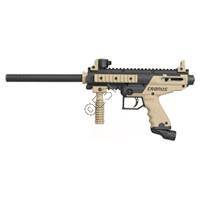 The Cronus combines Tippmann's legendary performance, and durability. It's internals are almost identical to a 98 customs, this means the Cronus will work just as flawless as the 98s. The body of the Cronus is a high impact composite shell, meaning it will be very lightweight. To imrove comfort, the Cronus is coated with soft molded rubber grips. The Cronus has an internal gas line, instead of a braided hose. Customizing the Cronus is easy, as it can take tactical upgrades on any of its four picatinny rails. The Cronus comes in three different versions, which are outlined at the bottom of this page. Tippmann's entry level tactical paintball marker. Comes with mock silencer, stock, and carry handle. Same great tactical gun, now in olive! 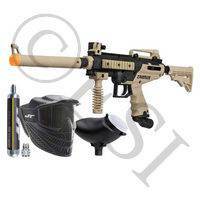 Great for beginners, players getting back into paintball, or casual players. Both of these are great options for someone who is looking to get into tactical paintball. However, the Cronus is the better value. The Spyder MR 100 has an external gas line, which can get in the way during play, or even get bent from a slide. The Cronus' internal gas line ensures these problems do not happen. The Cronus has four picatinny rails, where the MR100 has only two. This means the Cronus is much better suited for those who want to upgrade it. Aiming down your sights is much easier on the Cronus, as it has an offset feed elbow for the hopper. The MR100's feed elbow extends from the very top of the gun, making aiming much more difficult. The Cronus is also competitve with the BT Omega, however once again the value of the Cronus makes it the better choice. BT Omega's are not very customizable. With only a limited number of after market upgrades, as well as only one picatinny rail, the Omega is not intended to be upgraded. Like the MR100 in the previous compariso, the Omega also has an external upgrade. 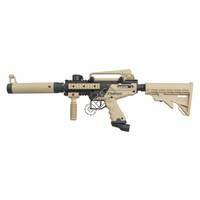 Tippmann is a name that is synonymous with durability and reliability. You just can't beat their costomer service, and how they stand behind their products. 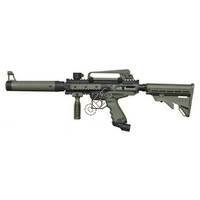 The basic Cronus comes with the basic gun, spare parts, tool kit, 9.5 inch barrel, sights, and a vertical forgrip. The Cronus Tactical comes with all of the things the basic comes with, as well as a fake suppressor, carry handle, and a collapsible stock. The Cronus powerpack includes the Cronus Basic, as well as a tank, mask, and hopper.